Courtyard is the smartest way to keep your members connected. Courtyard provides you with a private, interactive directory website where your members can share and update their contact information. It’s the perfect solution for churches, schools, homeschool groups, or any group that wants to help their members connect with one another. 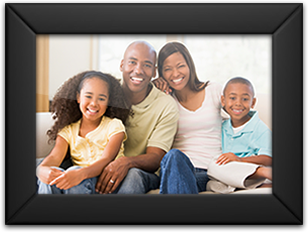 Unlike business-oriented software, Courtyard keeps your members organized by family, just like you would in a printed church directory. Writing to say how impressed I've been with your online directory application. Very clean and intuitive, which I think are the most important features for the wide range of users we will be serving. Even our less-than-savvy users are figuring out how to navigate the directory on their own. I can’t believe someone didn’t think of this sooner. Elegant, economical, functional, indispensable, user-friendly, convenient, practical, purposeful. Want to find an example of all of these things in one convenient package? Look in the dictionary under COURTYARD! Or just go to courtyardapp.com. I spent days researching for an online Christian-based directory platform that would allow service members to have instant information on their iPhones, but NO other system included the full package of free customer service, online data entry, and mobile applications, except for Courtyard! 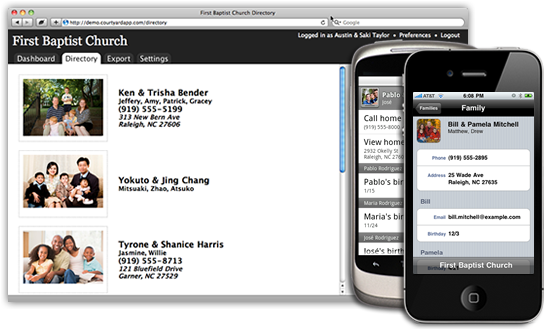 We understand that everyone in your church may not want to access your church directory online, or even be online. That’s why we provide high-quality printouts. Whether you just need one copy, or one for each of your members, we’ve got you covered. The interactive map gives you a new perspective on your community. You may be surprised to find out who lives just around the corner! Putting everyone on a map would be a daunting task to perform by hand, but with Courtyard, it couldn't be easier. We offer free Email & Phone Support to all of our customers, to make sure you never get stuck. We would love to hear from you. Our Data Import Process gets you up and running in record time. No manual data entry, and no setup fee required. 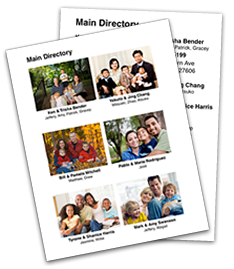 We allow you to break your directory into Sections, to include missionaries, former members, shut-ins, and more. Customize your directory by adding Custom Fields and by changing field options & permissions. Or, check out our Feature Tour.